Here is a really great program for your children for English Class. It is called Essentials in Writing. This is a complete writing course that focuses on composition. I thought this would be great for my little M as she really enjoys writing. We chose the Ninth grade which centers on sentence structure, paragraphs, essays, and research papers. Grammar is still strongly emphasized throughout the course. The course is on two DVDs and includes a third that has printable worksheets. The company is working through the grades to phase out the third DVD and is changing over to PDF downloadable worksheets. You would then receive an email with the downloads. This will help to cut down on costs. The Ninth grade course is $40. Should you desire to do so, you can purchase a pre-printed workbook for $20 if you do not want to print off the worksheets. What I like most is that you actually have a teacher, Matthew Stevens, on the DVDs who explains and shows on the board exactly what he is talking about. His explanations are clear and easy to understand. This was especially helpful when showing how to plan and draft a paragraph and essay. My daughter was able to sit down with headphones on and complete a class without any extra help needed. Mr. Stevens holds your attention throughout the lesson. I also liked that they start out with sentences and learning how to create proper sentences. They deal with compound sentences, incomplete sentences, simple sentences and run on sentences just to name a few in the first 8 lessons. This is something my daughter really needed. She often writes with run on sentences and needed some help with remembering her punctuation. Once your child has completed the lessons on sentences they move right into paragraphs. There are 10 lessons on paragraphs. This section actually walks your child through the steps of building a good paragraph. This will help them to move beyond the simple paragraphs they used to write and move them on to a better written paragraph. My daughter needed help with the expository paragraphs. She has previously had problems with explaining and expanding her topic without just writing single, bullet type sentences. There is repetition built in to this portion that will help your child write paragraphs with ease. The last topic covered is essays. Each unit builds on the previous unit. You go from sentences, to paragraphs to essays. Simple easy steps that walk you right through. Once they have reached the essay lessons they will learn about the different kinds of essays and how to form them. Below is an example of one of the first things they learn in the essay lessons. 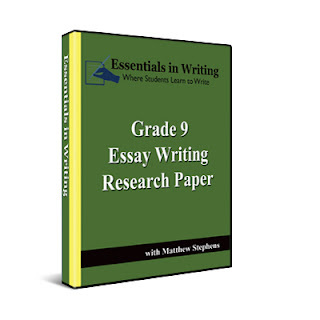 In Essays they will learn to write different types of essays; Persuasive, Personal and Expository. The first essay they work on is a personal essay. This was a little easier for my daughter to do as she was writing about how someone affected her. I really appreciate how they show the differences between the different types of essays. Above is a sample lesson from Paragraphs and below is one from an essay assignment. The last section involves Research Papers, which I have looked at, but we have not delved into yet. I am sure it will be just as good as the rest of the program. I think this course would be great for most homeschoolers. I am sure there are some who just seem to write naturally, but I like how this guides them right through the thinking process, writing out a draft, doing corrections and of course the final piece of work. A couple of my children hated to write a draft and then write it all over again with corrections, but it is explained in the program why this is so important. Many of the TOS Crew reviewed other grades, so if you would like to see what they had to say, be sure to click on the banner below.